23 February 2015, at 12:00a.m. A review of progress made in nine exploratory research projects in the last year by researchers at Georgia Tech Research Institute in the US. Each year, the Agricultural Technology Research Program (ATRP) funds special exploratory research projects. With a theme of 'thinking outside the box', these projects investigate a highly unconventional idea, which if successful, could lead to significant improvements over current systems and/or processes. The projects also play a unique role in ATRP’s quest to drive transformational innovation in the poultry industry. Transformational innovation can be defined as the creation of something entirely new that eventually eclipses the existing norm. In short, exploratory research projects can help to define the next generation of poultry processing methods and technologies. Exploratory research projects are the incubators for ATRP’s full research portfolio, he explains. So, researchers seek to provide a balance in the exploratory research projects across the ATRP research thrusts in robotics and automation systems, environmental and energy systems, and worker and food safety technologies. Nine exploratory research projects were funded in fiscal year 2014. The following briefs highlight research results. Researchers programmed a humanoid Baxter robot manufactured by Rethink Robotics to assess its ability as a robotic solution for poultry processing tasks. They designed custom grippers in-house (based on a commercially available Robotiq gripper) and integrated them on Baxter. The in-house designed grippers proved effective at grasping bird front halves from a moving conveyor and placing them on deboning cones. Researchers explored a group of new antimicrobial compounds to reduce pathogens in food products. They found low levels of compounds can reduce Salmonella Typhimurium on chicken and lettuce more effectively than 50ppm chlorine in 10 minutes. This discovery was confirmed by blind tests performed at the USDA-ARS Richard B. Russell Research Center and the Georgia Poultry Lab. It was noted that the antimicrobial efficiency was unaffected by room temperature. Researchers evaluated the feasibility of using commercially available robotic systems to perform grow-out house management tasks. The systems were outfitted with 2D and 3D sensors/cameras and operated in an experimental grow-out facility at UGA’s Poultry Research Farm in Athens, Georgia. Video and audio data were collected with 500 birds for a six-week grow-out cycle in a miniature-scale house. 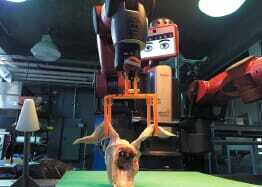 Researchers developed and calculated metrics for the robotic systems and for humans, which allowed for quantitative analysis of the birds’ reactions to both. Results indicate that there is not a negative impact on the performance of the birds due to the operation of the robotic systems when compared to their reactions to humans. Researchers modeled the water usage in a typical poultry processing plant to define areas of potential optimisation of water use. Based on the model, the plant can adjust water use for particular processes, which can be used to estimate fluctuations of food pathogen contamination. Researchers also developed a computer model for higher fidelity simulation of the poultry chilling process. The model keeps track of the temperature history of birds currently in the chiller and the water temperature of the chiller at various locations at each particular time. Researchers explored the feasibility of using algae as feed for broiler chickens during grow-out. They found the use of chitosan in small concentrations to be a viable means of harvesting algae. 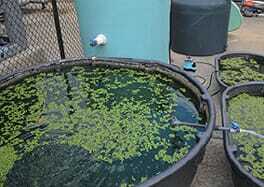 They were also able to produce approximately 20kg dry weight of algae and duckweed combined. It was decided that a full broiler trial would not yield sufficient data at this point, and instead, the team opted to conduct battery trials involving day-old chicks in a controlled environment requiring less feed. Researchers are studying better low-pathogen concentration approaches to improve pathogen prevention and control in large-volume poultry processing samples. During FY 2014, the research focused on completing a repeatable method for deploying growth mediums within the reactor. Experiments used Salmonella-inoculated tryptic soy broth and whole bird rinses. Subsequent industry interactions highlighted the need to address improvements to classical culture methods in order to reduce enrichment time and enhance viable pathogen recovery from non-liquid samples, for example, in ground poultry. Researchers are developing perception algorithms and 3D sensing modalities that will learn, model and track deformable poultry objects (such as chicken front halves) for robotic manipulation. The goal is to develop a system that can continually track an object while it is being handled – gripped, pulled, flipped, cut, etc. – and adapt the manipulation in real time. This adaptive ability is crucial to robotic handling of poultry products, which are variable by nature. During FY 2014, researchers further improved modelling and data alignment algorithms. They also integrated a developer pre-release of the new Microsoft Kinect Version 2 sensor to obtain higher quality data with greater resolution and improved precision. In addition, analysis of initial results produced using a current deformable data alignment method showed that both shape and physical characteristics, specifically stiffness, can be recovered by image data alone, where no prior physical or shape models exist. This can then be used in simulation for improved perception and manipulation. Researchers evaluated the effectiveness of ultrasound for the inactivation of Salmonella in poultry processing chiller water. In experiments using intentionally contaminated water, simulated chiller water and actual chiller water, it was found in all cases that samples treated with ultrasound, combined with either different concentrations of chlorine or peracetic acid, exhibited slightly better disinfection than samples treated with the chemicals alone. Researchers concluded the study indicates that it may be feasible to use ultrasonic energy to enhance product safety. However, cost-effective scale-up of the technology may prove challenging given the incremental benefits. Researchers evaluated the incorporation of ice slurries in the poultry chilling process, with the goal of significantly reducing water use and allowing for faster chilling of product. It was thermodynamically quantified that a unit of ice slurry has a higher cooling capacity than a similar unit of liquid water and, therefore, should require less mass to achieve a comparable cooling result. For example, approximately 125 per cent more liquid water is needed in comparison to ice slurry (half ice-half liquid) given each system is experiencing a 32°C temperature rise. There would thus be less total water needed (in slurry form) to address a chiller’s heat load. The ability to pump slurry throughout a facility adds to its attractiveness when compared to ice formation. In addition, the slurry serves as an excellent means of refrigeration load deferral to off-peak hours when leveraging cooling capacity storage. A software platform was used to begin quantifying this culminating economic benefit.